Cake for breakfast? Don't mind if I Do. 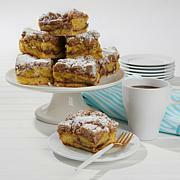 Made with sour cream, these coffee cakes are perfect for a morning treat or an after-dinner dessert paired with coffee. Enjoy a scrumptious pile of butter streusel on top of the cinnamon cake, and a deliciously crunchy cocoa crumble on the chocolate chip. With both cakes tasting as good as they look, it will be hard to pick a favorite. 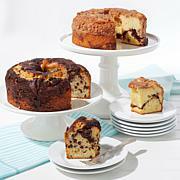 We recommend placing the cakes either in the refrigerator or freezer right away especially during warm weather. The cakes thaw in about 30 minutes. Slicing the cakes is easier when slicing the cake chilled from the fridge. Next, you will see that the cakes are individually wrapped and will stay fresh in their wrapper at room temperature for up to 7 days. They will last up to 14 days if stored in the fridge and up to 3 months in the freezer. There is no need to peel the outer paper from the cake. Using a serrated knife, start from the center of the cake and gently saw through the outer paper. Cut a wedge and lift the piece out with the flat side of the knife. For added enjoyment heat in the microwave for 15-20 seconds. Contains eggs, wheat, milk, soy, peanuts and tree nuts. Ingredients: Chocolate Chips (Sugar, chocolate liquor, cocoa butter, dextrose, soy lecithin (an emulsifier), vanillin (an artificial flavor), Sugar, Whole egg, Flour (bleached wheat flour, iron, niacin, thiamin mononitrate, riboflavin, folic acid. na), soybean oil, Sugar, Corn Starch, Water, Sour Cream, Pudding blend (sugar, modified corn starch, whey (milk), wheat gluten, salt, sodium aluminum phosphate, soybean oil, sodium bicarbonate and 2% or less of each of the following: propylene glycol esters of fatty acids, mono- and diglycerides, diacetyl tartaric acid esters of mono-diglycerides (DATEM), artificial flavor), Cake blend (sugar, enriched wheat flour (wheat flour, niacin, reduced iron, thiamine mononitrate, riboflavin, folic acid), modified corn starch, yogurt powder (non-fat milk solids, lactic acid, cultures, natural and artificial flavors), salt, mono- and diglycerides, sodium bicarbonate, sodium aluminum phosphate, whey (milk), sodium stearoyl lactylate (ssl) and 2% or less of each of the following: buttermilk powder, xanthan gum, stabilizer blend (cellulose gum, guar gum, gum arabic, carrageenan,xanthan gum), sodium caseinate (milk), yellow corn flour, colors (turmeric, paprika), natural and artificial flavors), cocoa powder, Ground Cinnamon, Vanilla extract (water, sugar, caramel color, artificial flavor, citric acid, and sodium benzoate. I sent this as a gift to family members. They absolutely loved these cakes. They were moist and delicious. I will be ordering them again when I visit family in the fall. Looking forward to getting them. 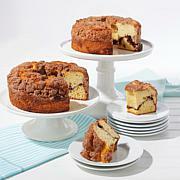 I enjoyed the cinnamon cake, but the chocolate chip was hard and left an aftertaste. Tasted best heated with a little butter. Really a treat while enjoying a cup of coffee. I was so looking forward to these cakes, but was a bit disappointed. The cakes are much smaller than I expected and not nearly as moist as the presentation led me to believe they would be. Also, the crumb topping was kind of bland.